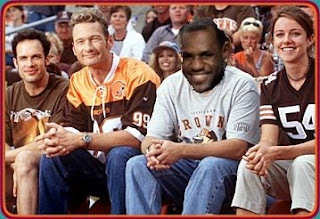 Drew Carey's take on Cleveland: It rocks. Lebron's take: It has rhythm, but South Beach makes me dance. The combination of a Sox off-night and Lebron taking over everything sports means chances are you watched Lebron tell Cleveland to F-off while making the move down to Miami. Personally, I like it. There are 80-something games in an NBA season and you can bet every single team out there is going to be gunning for this super Heat team. Was it selfish to have a prime time show RIPE with ESPN commercials to announce his decision? Eh, probably. Will Lebron win a ring down in Miami. Eh, probably. Will there be riots in Cleveland. Eh, probably. Did Jordan leave the Bulls after getting beat by the Pistons 3 years in a row? Nope. He resolved to win, and did so. Even if Lebron and company win 2 titles, then bring in Chris Paul and win 4 more, it's not going to be Lebron's title. I'm just glad "the Decision" is over. Also, I hate ESPN more than ever. Different post, different time. That is a killer line. I'm using that sometime in life.